We’re thrilled to have NYT and USA Today Bestselling Author Lenora Worth take over the Tule Blog. It’s the release day of her first novella with Tule, Driftwood Cowboy! Enjoy a note from Lenora below and be sure to leave a comment to enter the giveaway! So I’ve entered the world of the novella. I’ve done a couple of novellas and I love the format. I’m very happy to have my first Tule novella out as Driftwood Cowboy was a story that would not leave my head or my heart. But it didn’t quite fit in. I also write for Harlequin’s Love Inspired line in both romance and romantic suspense and I write for Superromance and I’ve done one novella for HarperCollins/Zondervan. Love all of that, but wanted to write this story. Tule seemed like a perfect fit. I love beach stories since I grew up in southwest Georgia, just above the Florida line. I’ve traveled to beach locations with family and friends through the years and now I live on a bay just a few miles from the Gulf of Mexico. So this story got into my head and had to be written. Brodie Stevens is probably one of my favorite heroes. He is strong and determined and kind of a Jimmy Buffet type. (Love Jimmy Buffet, too. :) When he meets a woman who shatters his notions of what love is all about, his laid back life changes. For the better. But Brodie also helps Michelle to heal from her own tragedy. I hope you’ll join Brodie and Michelle on Driftwood Bay. It’s a place where misfits and tormented souls can go to find a bit or redemption and peace. And don’t we all need that? What’s your favorite beach location? 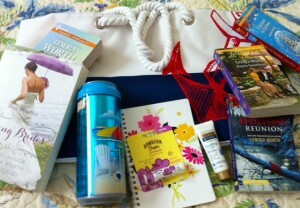 A beach tote full of books that also includes a $15.00 Starbucks card, protective lip balm and soothing lotion, a cool beach-themed insulated drinking cup and a small journal, all so you can relax and enjoy your own beach experience. Wow it sounds great. The only beach I have been to is Myrtle Beach in South Carolina but was great. I am almost done with the book, loving it. My favorite beach is Maui, been there once and so want to go back. Love sitting on the beach and reading. My favorite Beach location is Corolla, NC on the outer banks. My husband and I have gone twice with 4 other couples. That’s 10 people, 2 dogs & misc bugs (from the house, not brought with us) all in one house! Had a blast each time and can’t wait to go again. Crystal, that houseful sounds like fun! I live on the West Coast, but my favorite beaches are on the East and Gulf Coasts. I can’t pick just one!! I love Grayton Beach, Florida and Mettle Beach, South Carolina! Thanks! This book looks so good! I read an ARC of Driftwood Cowboy and I enjoyed reading it. I hope you’ll write more books set in Driftwood Bay. I hope to do that very soon. I think Sam needs a story! I love Key West. So beautiful. I hope there are more books based in Driftwood Bay. I would love to read Sam’s story. Denise, see comment above to Moran!! Sam might have to meet Michelle’s sister Madeline!! I live in Virginia Beach, so that has to be my favorite! 8-) Look forward to reading your novella. Driftwood Cowboy sounds captivating and Driftwood Bay especially lovely. My favorite beach is in Florida, white sand, peaceful setting and beautiful. New Smyrna beach. New Smyrna Beach, Florida is my favorite. my sister took me there when i visited her in November. Oh wow this book sounds awesome and I would love to read it. The only beach I have been to is Myrtle Beach in South Carolina and I loved it. Can’t wait to read this book! My favorite beach is old silver beach in Falmouth, Massachusetts. I’ve been going there since I was little. Great memories and great fun! I grew up on Long Island, when LI sound was so clean, you could see the bottom when the water was over your head. Sad the way it is now. I have such good memories of catching fish for our cat with my Mom & crabbing with my Dad, searching for horseshoe crabs with my friends, making stuff with driftwood & beach glass. PS I don’t have an ereader—still prefer the paperbacks. Love going to the beach, wish I could more often. Oh my gosh! This sounds great! Can’t wait to read! We’re from the Midwest & head straight south to the Alabama beaches for relief! I love cowboys!!! I actually married one. We live along near the Gulf of Mexico, too! Lafayette to be exact. He works on the rigs in the Gulf. I’m a HUGE parrothead!! !LOL Can’t wait to read your book! Thanks, Suzie Q. I’m very familiar with Lafayette. Lived in Louisiana for over thirty years. I read Driftwood Cowboy wonderful book.I highly recommend reading Driftwood Cowboy. I am looking forward to reading more books by Lenora Worth. Just finished your book on the way back from Florida. I really enjoyed it. Glad to see more books will be out. It’s pretty cold in Ohio :( so I’d take just about any beach. I love the water and can find something beautiful about every type of beach. I absolutely LOVE the beach. My favorite place to be is in Gulf shores. It’s still close to home and I still get my toes in the sand. Seabrook Island, SC is my favorite beach. I live near Tallahassee so I love the beach whenever I go and of course I have a few books with me to read..I lived in south fla. so my favorite place is the beach to read and swim and just have fun! love cowboys so I can’t wait to read this book! My favorite beach is Jensen Beach but just going to Shell point is fine with me! Cocoa beach in Florida It’s been 5 yrs. but my daughter is getting married nearby so we’re all excited. It’s been a long time since I’ve been to the beach. Growing up my mom would take us to various Chicago beaches on Lake Michigan. In high school I would go to the Indiana Dunes & Warren Dunes in Michigan. Now, living in Minnesota there are a number of beaches along some of the city lakes but I’ve never been to them. I really don’t have a favorite because I haven’t been to or found one that I want to return to all of the time. I love going to the Washington/Oregon Coast. The only problem is I live to far away to visit it regularly. It has been a couple years, since I have heard that calm sounding, beautiful landscape. My favorite beach is Long Beach in Long Point Provincial Park, Ontario. It has great sand and wonderful shallow water. I loved Hawai’i when we were there, but we usually end up at Rehoboth, DE, Cape May, NJ, or Ocean City, MD, because they’re close to home. Myrtle Beach!!! We go almost every year!! For me it would be Gulf Shores, Alabama. I really enjoyed everything about this book. I enjoy the diversities of the beaches in Florida. From white sand beaches of Daytona to the brown tiny shell beach in Coco Beach. Well since I live in the middle of the US, I don’t have any beaches close by. And really I’ve never been to a beach. But if I could pick one to vacation at I would pick Hawaii. My favorite “beach” is in northern Michigan where my family has a cottage in Lewiston. It is my favorite place on earth! I`m not really a beach person. I haven’t been to the beach in a couple of yers but I spent many summer weekends with family on Miami Beach and down in Point Pleasant Beach neasr home in New Jersey. I’d love to travel to Australia!! Beautiful beaches. Can I say that the title of this book is marvelous? what a wonderful giveaway thank you so much!!!! I can’t wait to read this book!!!! I am very fortunate to live near the beautiful beaches of the Florida Panhandle. After all the spring break nonsense is over,I plan on spending many summer days there. I love the beach so much!!! Personally, I think the Gulf Coast has the prettiest and softest sand. But Malibu is nice, too! The beach and ocean are my happy place. Living in Florida there are beaches all around us on the west coast. I would love to have this to take along! Thanks!! I just let you take me to the beach in Driftwood Cowboy The scene where she rides right toward him in the whitecaps its like your right there. Well Ben, one thing I do know is if a writer is peblishud and really doing well, they will not talk to a lesser known writer even if this lesser known author is far more skillful than they are lol. But I only know of a few self-published writers making any real money the rest struggle. One thing I cannot stand is when someone self-publishes or even gets a publishing deal, they are suddenly an expert on writing and all the ins and outs of the business when in fact they are not. I don’t like conceit and am certainly not an expert. The truth is if by chance I became a best selling writer, I wouldn’t know much more than I do now. There are millions of unknown unpublished writers as good if not better than any famous writer. I write for the love of it and like everybody, simply want an honest chance to become read by many. I say market your work and do it with class.